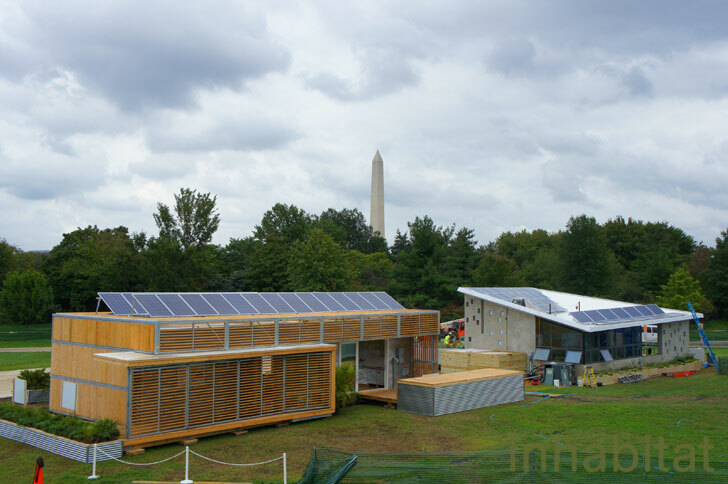 The 2011 Solar Decathlon just kicked off in Washington DC as 19 stunning sun-powered homes popped up in the National Mall. 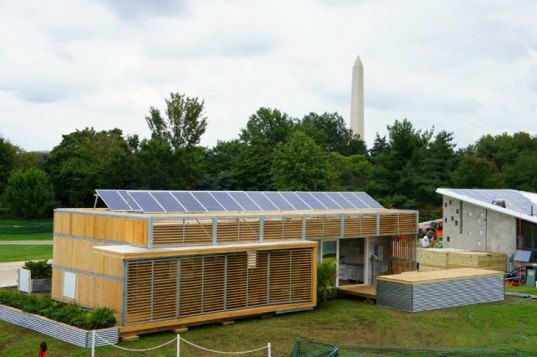 This annual competition challenges teams of students from across the United States and around the world to design and build solar-powered prefabricated houses, and the project that generates the most energy while scoring top marks in affordability and design takes home the prize. 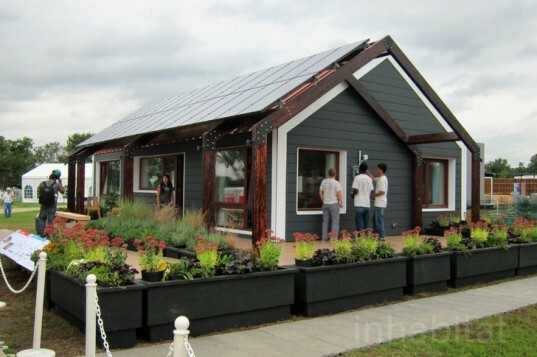 We had the chance to take a first look at this year's ultra-efficient homes - hit the jump to check out our exclusive photos! We have affectionately nicknamed SCI-Arc’s house the “puffy house,” as it creatively wears its insulation on its exterior. The home is actually called CHIP, which stands for compact hyper-insulated prototype, and it is designed to challenge every architectural and engineering preconception about zero energy homes. Team Florida’s got a prime location with the Washington Monument located behind it. 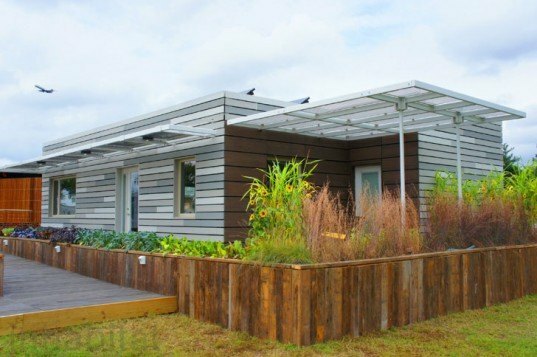 Using superior insulation, solar thermal and solar PV, and recycled materials, the FLeX house aims to be the ultimate net-zero home built specifically for Florida’s hot and humid climate. We love Team Ohio’s frosted glassy exterior. The enCORE house boasts 930 square feet of living space built around a central mechanical core, leaving lots of space for work, play, and sleep. The team used thin film solar photovoltaics atop the roof that were locally manufactured in Ohio and cost nearly 70% less than typical solar arrays. New Zealand’s First Light House was a favorite among Inhabitat and one of the houses that many of the students believe could be the ultimate winner. The beautifully butterflied house uses sheep’s wool insulation, and it has an innovative drying cupboard that dries clothes quickly by pumping solar-heated hot water through a metal exchanger. Several of the teams, like Massachusetts, were still working to complete their homes when we arrived on Wednesday, but the hard work paid off — Massachusetts has one of our favorite houses in the competition! Called the 4D Home, the structure has an adaptable interior with a moving wall that lets the family change the sizes of the main room. The solar panel array is atop a trellis that creates shade for the panoramic front porch. 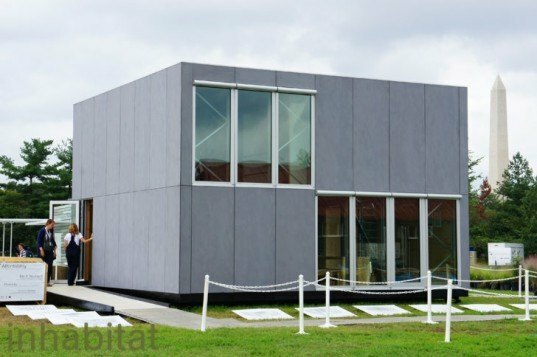 Belgium’s team from Ghent University built a boxy E-cube designed to be a DIY prefab that you could build yourself without much special skill. The goal of the Ghent University students was to create a comfortable, solar-powered house with a lot of space on a small budget. Simplicity is at the core of their design and the home is stripped of nonessential components and finishes, leaving its structure and façade exposed to the interior. The home is totally prefabricated into a kit of parts and geared towards those who have the inclination to build the home themselves, but don’t have the time to construct it from scratch. 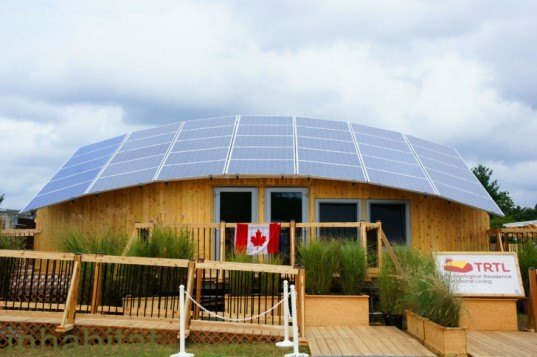 Team Canada’s TRTL home packs an incredible array of green building strategies into a compact 1,000 square foot home nestled beneath an arched 8.3 kW photovoltaic panel system. The home’s shape, along with its interior design, was inspired by the culture of Treaty 7 Native Peoples in Southern Alberta. The modular home was designed specifically for Southern Alberta and could help alleviate housing problems for the native communities. 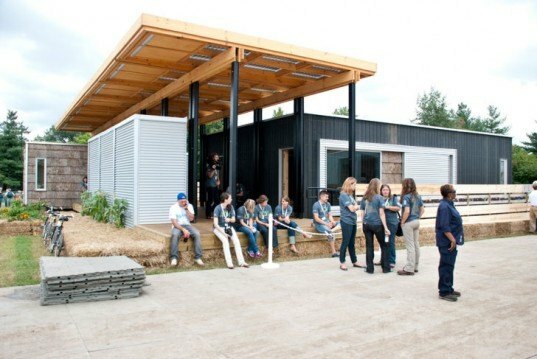 The University of Illinois at Urbana-Champaign’s Re_home is designed to be rapidly deployed to provide housing in the event of a natural disaster. The home consists of two modules that can be transported on a single trailer, and a flexible floor plan allows it to accommodate a range of living situations. Team Maryland’s WaterShed house was inspired by the Chesapeake Bay ecosystem. This resource-efficient employs a wide range of water-saving features including a rainwater channeling split butterfly roof, a water filtering green roof, and an edible garden wall. Grey water is collected from the dishwasher, shower, lavatory, and clothes washer and filtered through the home’s constructed wetlands, which run right through the middle of the house. Appalachian State University’s Solar Homestead was inspired by traditional Appalachian settlements – it consists of a central living core that opens out to a generous outdoor living space called the Great Porch. A phase-changing Trombe wall system helps regulate the interior temperature while 42 bifacial solar panels supply the building with energy while providing filtered daylighting.The solar array also provides shade for the Great Porch, which connects the main home with a storage system and a smaller space that could be used as an office or guest bedroom. Purdue University drew inspiration from traditional Midwestern houses to create to – an incredibly efficient residence that doesn’t sacrifice quality or comfort. 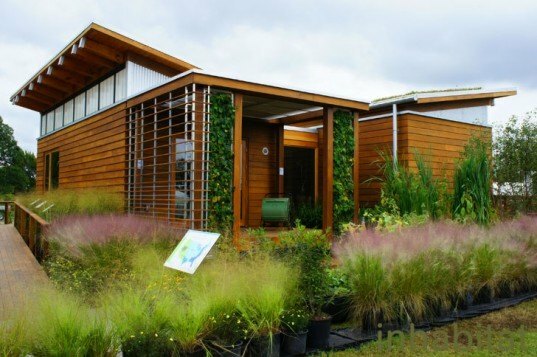 The house comes complete with a self-watering biowall, a multi-process air purification system, and a heat pump hot water heater. INHome was designed with the typical Midwestern home owner in mind, meaning that it’s aesthetic isn’t as intriguing and modern as some of the other homes, but we think it will resonate with a lot of the public. 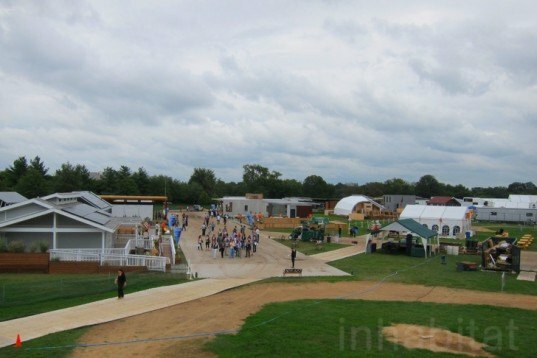 The Solar Decathlon in Washington, D.C. is happening until October 2, 2011. The official winner will be announced on October 1, but the scores are already starting to come in. Stay tuned to Inhabitat for up-to-the-minute updates! interesting projects and want to know more about it. The weather is a little grey, but that hasn't dampened our spirits! Editor-in-Chief Jill Fehrenbacher, Video Editor Brit Ligget, and New York Editor Jessica Dailey head in to the Decathlon (behind the lens is our lovely photographer and contributing writer Amanda Silvana Coen). Sixteen of the teams are from American universities or colleges. We have affectionately nicknamed SCI-Arc's house the "puffy house," as it creatively wears its insulation on its exterior. The home is actually called CHIP, which stands for compact hyper-insulated prototype, and it is designed to challenge every architectural and engineering preconception about zero energy homes. We love Team Ohio's frosted glassy exterior. A jury of professionals from architecture, engineering, and communication fields will be judging the houses on everything from their overall architecture and marketability to their appliances and energy-efficiency. The enCORE house boasts 930 square feet of living space built around a central mechanical core, leaving lots of space for work, play, and sleep. The team used thin film solar photovoltaics atop the roof that were locally manufactured in Ohio and cost nearly 70% less than typical solar arrays. The homes will also be judged on their affordability, a category of which we are quite interested in seeing the results -- some of these homes, like Team New Zealand's, are pretty elaborate. If the home cost more than $600,000 to build, the team will receive a big fat zero for affordability. New Zealand's First Light House was a favorite among Inhabitat and one of the houses that many of the students believe could be the ultimate winner. The beautifully butterflied house uses sheep's wool insulation, and it has an innovative drying cupboard that dries clothes quickly by pumping solar-heated hot water through a metal exchanger. Several of the teams, like Massachusetts, were still working to complete their homes when we arrived on Wednesday, but the hard work paid off -- Massachusetts has one of our favorite houses in the competition! Called the 4D Home, the structure has an adaptable interior with a moving wall that lets the family change the sizes of the main room. The solar panel array is atop a trellis that creates shade for the panoramic front porch. Teams will be asked to complete tasks like cooking, washing the dishes, and doing laundry, while maintaining a comfortable interior temperature. Winners of each of these fields will begin next Tuesday, September 27, and continue through the week with the final winner being announced on Saturday, October 1. 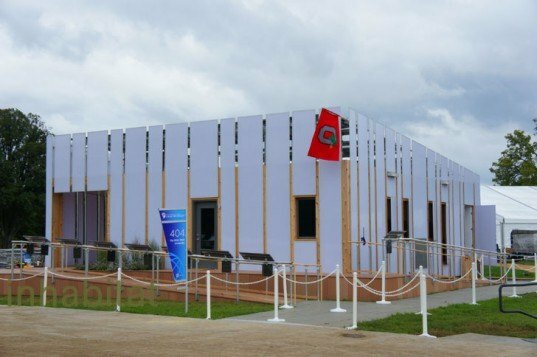 Belgium's team from Ghent University built a boxy E-cube designed to be a DIY prefab that you could build yourself without much special skill. The goal of the Ghent University students was to create a comfortable, solar-powered house with a lot of space on a small budget. Simplicity is at the core of their design and the home is stripped of nonessential components and finishes, leaving its structure and façade exposed to the interior. The home is totally prefabricated into a kit of parts and geared towards those who have the inclination to build the home themselves, but don’t have the time to construct it from scratch. Team Canada's TRTL home packs an incredible array of green building strategies into a compact 1,000 square foot home nestled beneath an arched 8.3 kW photovoltaic panel system. The home's shape, along with its interior design, was inspired by the culture of Treaty 7 Native Peoples in Southern Alberta. The modular home was designed specifically for Southern Alberta and could help alleviate housing problems for the native communities. 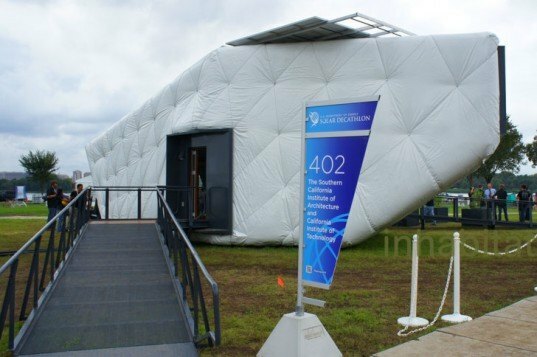 The University of Illinois at Urbana-Champaign's Re_home is designed to be rapidly deployed to provide housing in the event of a natural disaster. The home consists of two modules that can be transported on a single trailer, and a flexible floor plan allows it to accommodate a range of living situations. Team Maryland's WaterShed house was inspired by the Chesapeake Bay ecosystem. This resource-efficient employs a wide range of water-saving features including a rainwater channeling split butterfly roof, a water filtering green roof, and an edible garden wall. Grey water is collected from the dishwasher, shower, lavatory, and clothes washer and filtered through the home's constructed wetlands, which run right through the middle of the house. Appalachian State University's Solar Homestead was inspired by traditional Appalachian settlements - it consists of a central living core that opens out to a generous outdoor living space called the Great Porch. 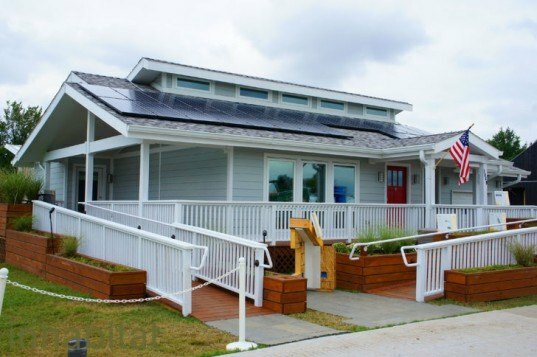 A phase-changing Trombe wall system helps regulate the interior temperature while 42 bifacial solar panels supply the building with energy while providing filtered daylighting.The solar array also provides shade for the Great Porch, which connects the main home with a storage system and a smaller space that could be used as an office or guest bedroom. 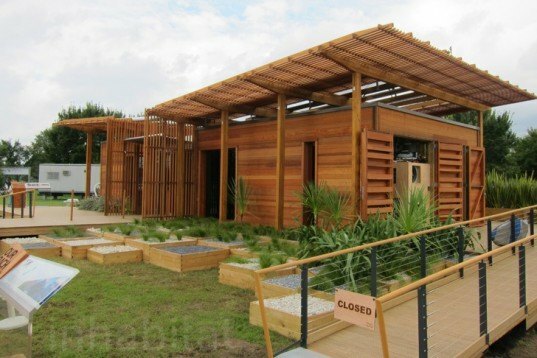 The Solar Decathlon in Washington, D.C. is happening until October 2, 2011. The official winner will be announced on October 1, but the scores are already starting to come in. You can follow the competition online here.